The First Mate is a Ninjago Pirate from Captain Soto's Crew. Years before the ninja owned the Bounty, the Pirates did. He was left in charge of stearing the ship. One day he left No Eyed Pete in charge and the ship crashed. The Crew went with. Years later Lord Garmadon created the Mega Weapon and wished the pirates back. 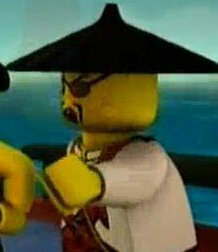 Facts about "First Mate (Ninjago)"
This page was last edited on 7 September 2016, at 03:31.